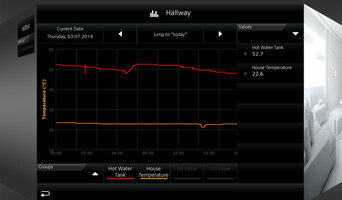 At Function Control Ltd. we help our clients to realise the ideals of a truly smart home. We design beautiful and stylish home control systems using future-proof technologies to provide increased comfort, added functionality and energy savings. We can design systems of all sizes from single room lighting control for a lounge or extension to whole building control integrating heating, lighting, ventilation, curtains, sockets, electrical accessories, security, cameras, music and home cinema. KSLD is an independent architectural lighting design consultancy with clients across the globe. We specialise in using light to raise brilliant architecture to artistic glory. Established in 1989 we have a long record of successful projects including Arts Centres, Museums and Galleries, Hotels and Restaurants, Commercial and Historic Buildings. Our lighting designers are selected from Arts, Architecture and Theatre backgrounds; we deal with light as a design medium, unique in its lack of substance but vital in creating the visual impact of the project. 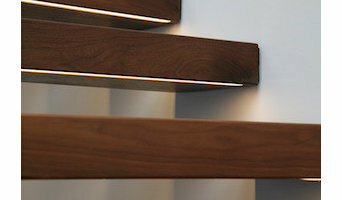 Our specialties include working with historical or listed buildings to use lighting to highlight the best aspects of the architecture, working with landscapers to develop low cost-high impact lighting outdoor lighting schemes, and ensuring that whatever lighting manufacturer we use, you get the best quality lights within your budget. Making Your Vision Become A Reality! Luxury Lighting Boutique are one of the UK's leading luxury lighting and designer lighting stores and serve the whole of the UK through our online retailing presence. 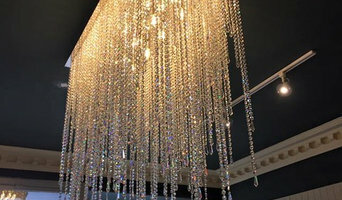 Considered to be Edinburgh's original crystal chandelier company, we offer decades of experience along with a bespoke collection of beautifully created chandeliers. 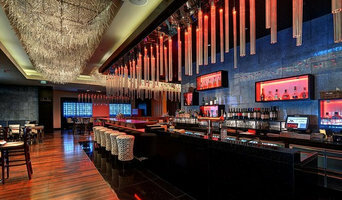 We believe that chandeliers can be the focal point and add a sense of luxury, elegance and sophistication to any room. Chandeliers are beautifully created and can be an excellent reflection of your own individual style and personality. At the Luxury Lighting Boutique, we appreciate and understand that selecting the correct chandelier to suit your requirements can take a lot of time, effort and patience. Selecting the correct size, style and lighting can be a very stressful and daunting process and that is why we hope that all of our customers contact us prior to ordering to discuss their needs and requirements in more detail. We have a vast collection of stunning luxury lighting products from crystal chandeliers to ceiling lights including basket and pendants, and modern, traditional, contemporary and blended lighting designs. You can visit out gorgeous UK chandelier showroom which is located at 21 Strathearn Road in the Marchmont area of Edinburgh We also offer chandelier installation and refurbishment services through the help of our sister company, Keith Gunn Electrical Solutions, who will clean, refurbish and maintain your chandelier and lighting product so that it lasts a lifetime. Eddins Lighting Limited is specialized into supplying Decorative and bespoke light fittings according to customer’s requirements. Our bespoke division provides expert design and manufacturing solutions for projects all over. Equipped with the latest technology to ensure quality of design and product, our manufacturing and design specialists provide detailed attention to client's requirement. 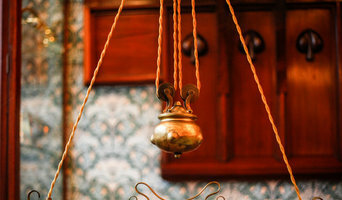 Edinburgh-based specialists in antique lighting, with experience in restoration and renovation. Collectors of WAS Benson, and the largest collection of vaseline glass in Scotland. Dorval moved to a new much larger premises in the aptly named 'Steads Place' off Leith walk and continued to grow. In 1977 Dorval Enterprises was renamed Dorval Lighting and became a limited company. In 1980 John's son Peter gave up his work as a constuction engineer to join the business. With Peter's expertise in business he was able to continue the growth of Dorval Lighting. Soon Dorval had again outgrown its home and it was time for a move. In 1985 we moved to our current 2600 square foot factory on Newhaven Road. In 1994 for the first time Dorval Lighting became a three generation family business when Peter's son Robbie left school to join the business. After 17 years of experience Robbie took over the reins and became Managing Director in 2011. 2017 marks Dorval Lighting's 40th anniversary and as a business with a solid customer base and excellant service over the years, has outperformed even John's early expectations. Apart from actually designing and creating lights, a lighting designer, or lighting specialist, will also know where in your home to install lights in order to create the visibility levels you need and the mood you desire for a space. All lighting specialists in Edinburgh, City of Edinburgh should be knowledgeable about energy efficient lighting and the technical installation of various lighting systems, so you can ask them for advice when it comes to updating your lighting systems. As well as lighting designers, Edinburgh, City of Edinburgh lighting manufacturers may also be able to create bespoke lighting systems that will be designed to fit perfectly with your home, or perhaps if you just want a few key lighting pieces then you can find the Edinburgh lighting manufacturers that sell the style you’re looking for. Floor lamps and side lamps are great ways of adding subtle lighting when you don’t want harsh overhead lights, or light sconces on the side of the walls are ideal for traditional, more formal settings, or perhaps you could opt for more unusual sconces that can work as an illuminated wall feature? Manufacturers should be lighting specialists too, so they should be able to advise on which lighting piece would work best where in your house. In the kitchen, pendant lighting is a popular choice to hang over the breakfast bar or dining table and undercabinet lighting is a convenient way of adding more light when preparing meals. Lighting designers and lighting manufacturers in Edinburgh, City of Edinburgh will be able to professionally install these lighting elements for you, so you won’t need to worry about wiring or positioning bulbs in the right place. Find a lighting designer or manufacturer on Houzz. Narrow your search in the Professionals section of the website to Edinburgh, City of Edinburgh lighting designers and lighting manufacturers. You can also look through Edinburgh, City of Edinburgh photos by style to find a design you like, then contact the lighting specialists or designer that worked on it.